F1 – Right! Who kidnapped my F1 and replaced it with exciting racing? The 2011 Formula 1 season has been nothing short of spectacular, and this week’s race in China was one of the most exciting Formula 1 races I’ve seen in a very long time. Best of all, there was overtaking! And not that silly meaningless back-n-forth type of passing you see in some left-turn-only races, but well planned, well executed, well defended passes for position and even the lead! For the past few years, the Pinnacle of Motorsports has been trying to find ways to enhance the ability of drivers to run closer and overtake one another. They tried skinnier front tyres, smaller rear wings, KERS, DRS, slicks rather than grooved tyres, and various diffuser regulations to retard wake turbulence, and apparently something worked. The question is, though, what was it that has made the difference? This is a sticky problem in which we have many inputs that were intended to enhance overtaking convoluted with many other rules and equipment changes recent years. Deconvolving all those various parameters and identifying the true reason why we’re seeing so much on-track action this season will be tricky, but as Kennedy said, “We choose to do these things, not because they are easy, but because they are hard.” So let’s get at it and see if we can untangle this mess of parameters and track down just why overtaking is so much more prevalent this year. A number of these changes were in place either last year or the year before and offered little in the way of overtaking assistance. The radical change in the front and rear wing geometries obviously did not help last year, or the year prior. They just resulted in the cars looking a bit awkward and unbalanced. 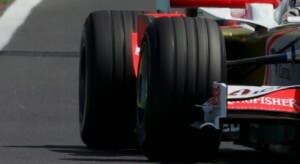 The enlarged front wing was in response to the skinnier front tyres as was the move back from grooved tyres to slicks. However, none of these helped improve the nose-to-tail racing in 2009 or 2010. Drivers still found it very difficult to follow close behind their competitors, and overtaking, even of obviously inferior machines and drivers, was challenging at best, and in some cases impossible. One change that was suppose to help in 2009, but was then removed for the 2010 season, was the addition of Kinetic Energy Recovery Systems (KERS). This system is designed to recover energy during braking and deliver than energy upon demand of the driver back through the drive train. There were initially two primary methods for storing this energy: mechanical via counter-rotating flywheels, and electrical via battery packs. While Williams experimented with the flywheel system, a system they eventually would sell to Porsche for their 911 GT3R-Hybrid, all 2011 KERS are electrical-based using battery packs that need to be disposed and replaced every grand prix. This was in part to help Formula 1 achieve some claim to being “green”, but that’s a topic for another post. Unfortunately, the KERS seemed to be nothing more than a “Push-not-to-be-passed” button similar to what we saw in the closing seasons of the Champ Car World Series and now in the IZOD IndyCar Series. If a driver was at risk of being overtaken, they would simply press the button to discharge their KERS. With both the predator and prey laying on the button, there was no net gain, and no enhancement of overtaking. There’s really only three other changes to the regulations that could have resulted in the much improved racing that we saw even at China, a textbook example of a Herman Tilke design: new diffuser restrictions, drag reduction systems (DRS), and a new tyre manufacturer in Pirelli. With three remaining possibilities, it’s still going to be difficult to ascertain how much influence each input has on the racing action, but let’s take a look at each one in turn and see what affect each might have. As with most things, I think we’ll find that it is a combination, a synergy, of influences that ultimately result in the improved show. The FIA has been working for a while on the diffuser regulations, but they’ve always seemed to overlook an exploit. In 2009, it was the double-decker diffuser that Ross Brawn’s BrawnGP team exploited so expertly to win both the drivers’ and constructors’ championships that year. In 2010, it was RedBull’s turn and their blown diffuser coupled of course with the amazing driving talent of Sebastian Vettel and Mark Webber secured the double championship. With the regulations, what the FIA sought to reduce was the amount of turbulence trailing a car. This wake turbulence disrupts the air flow over a following car’s front wing, causing the car to lose front end grip and become extremely unstable. The smaller rear wing geometry was intended to reduce this as well, and it did to a degree, but not enough to affect the changes the governing body wanted to see. The exploits and loopholes to the 2009 and 2010 diffuser regulations negated any intended effects of the regulations. In 2011, the rules governing the rear diffuser and the floor of the chassis were tightened up to eliminate the double-decker and the blown-diffuser exploits used in the previous years. The result is a reduction in the wake turbulence to the point where we’re finally seeing cars being able to run closer together nose-to-tail than in previous years. While this alone won’t enable one driver to overtake another, it certainly helps. I hesitate to call this a new innovation for Formula 1, lets call it a new and improved blast from the past. The method of reducing drag during the straights and increasing it under braking by changing the rear wing angle is not new. As soon as wings started appearing on F5000 and Can-Am cars, people started messing with variable wing geometries. It didn’t last long as many sanctioning bodies outlawed the devices, and drivers found the extra distraction to be more of a hindrance than a help. Now variable rear wing geometry is back, but with restrictions aimed at avoiding the double-deployment negation seen with KERS. While drivers are free to deploy the DRS any place on the circuit during practice and qualifying in order to achieve the maximum pace, its use is restricted to one specific straight on the circuit and is only available to the trailing car if and only if they are within one second of the leading car. While this seems to have had an effect in China, recall that there were several instances in Australia and at Sepang where the DRS was deployed by a trailing car and they were not able to gain ground on their competitor. To be certain, the reduction of drag is beneficial and can assist in overtaking, but the DRS alone can’t be solely responsible for the improved racing we’ve seen. Check out this video on the 1966 Can Am series review hosted by a VERY young Dave Despain and you’ll see the movable rear wing in action on a Chaparral 2E. 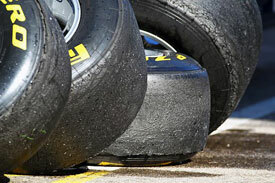 Perhaps the biggest change this year has been the exit of long-time tyre supplier Bridgestone and the return of Pirelli. As part of their mandate for being the exclusive tyre supplier to Formula 1, Pirelli was asked to provide a racing tyre with a more rapid rate of degradation than Bridgestone provided. We saw often in Formula 1, and with their sister company Firestone in IndyCar, a driver would run on the softer compound for dozens of laps without ill effect. Of course the whole point of having a softer compound is to provide a short-term gain in speed, but with a more severe drop off in performance as the tyres degraded. That wasn’t happening with the Bridgestones. During testing and during the first grand prix in Australia, there was much worry and consternation among the drivers, engineers, and even us fans. However, Pirelli produced the exact type of tyre that the series wanted, and its made even drivers who are well known for being smooth and easy on tyres like Jensen Button struggle to manage their tyre wear throughout a race. Its this disparity in tyre performance and the skills in tyre management that I feel to be the largest contributor to the excellent racing action we’ve seen so far this year. The test of this claim will come on the tighter, more technical circuits where the straights are not as long so that aerodynamic grip isn’t as critical and the DRS will have less influence. Regardless of what combination of things have resulted in the improved racing so far this season in Formula 1, I like it! Seeing driver actually able to mount challenges on one another and battle for position is fantastic and what circuit racing is about. It really has me re-energized and enthused for a series with which I was slowly becoming disillusioned and disinterested. So that’s my two cents worth of analysis on the situation, what are your thoughts? Leave me a comment below. I wholly agree with you Doug. DRS has helped, but the tires are mainly responsible for the overtaking we are seeing. Heck, we had a pass for the outright lead in China and it didn’t happen in the pits. After becoming jaded at the one stop processions last year, I have now become excited about F1 again. There is a bit of unpredictability during the race. 1. The differing degradation rates in compounds is causing vastly different speeds on track, thus allowing for overtaking. 2. The shorter stints and varying strategies on even the hard tires is causing for race leaders to come out of the pits into the scrum of slower cars, instead of being able to gap themselves and come out on a clean track. All this is making for a better show. And as the boys on Speed pointed out, the best may be yet to come. Pirelli has yet to use the super soft compound. They will first deploy it at Monaco where they are expecting 6 laps of life out of the tire before it starts to heavily degrade. We thought we knew China, and look at the excellent race we saw this weekend. Maybe the polesitter will not be guaranteed a win in the principality this year….